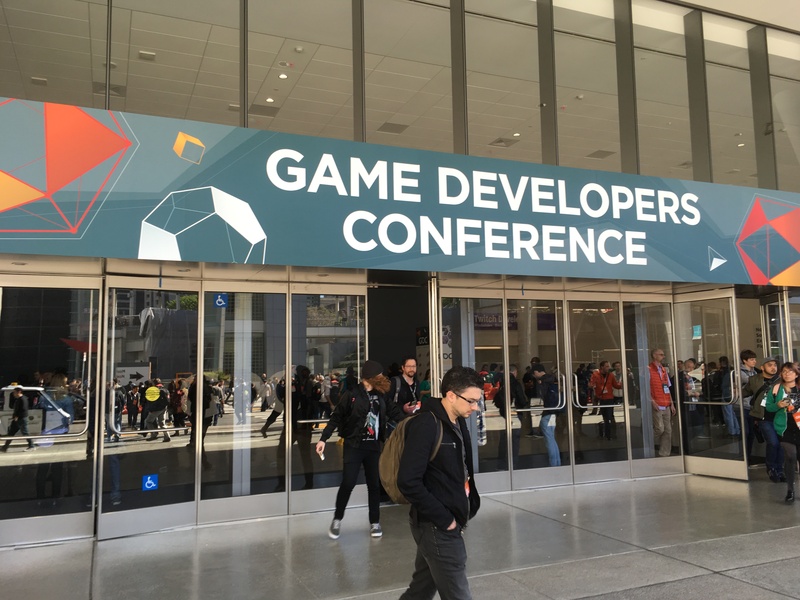 The 2018 edition of the Games Developer Conference has come to a close but there is still a lot more for us to show including gameplay videos, developer interviews and exclusive hands-on with several AAA and indie titles. In this post I’d like to take a quick jaunt through some of the cooler booths on display at this year’s show. By “cooler” I don’t necessarily mean “elaborate” or “expensive” but visually impressive or booths that offered attendees a unique experience. 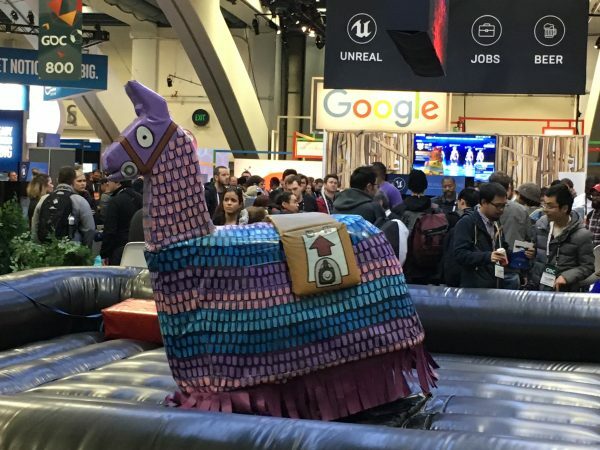 A booth with a ride-able Fortnite llama in place of the traditional riding bull is a win in my book. This tough looking llama was a draw for the entire conference, sadly I didn’t get a chance to go for a ride. 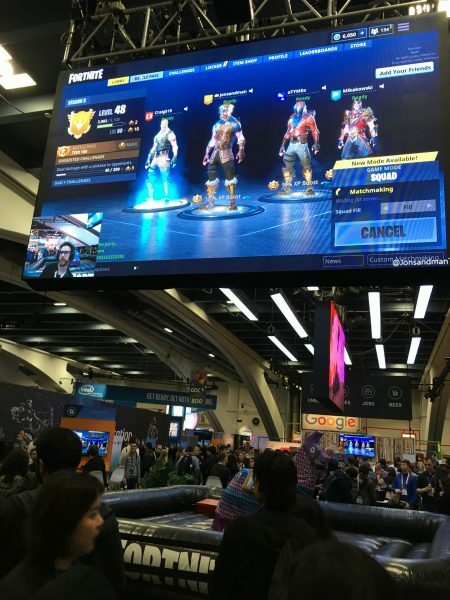 Above said conquerable llama was a large screen that showcased the Fortnite live-stream that Epic had going during the entirety of show-floor hour. Folks check out the PlayStation 4 Pro version of Fortnite Battle Royale. 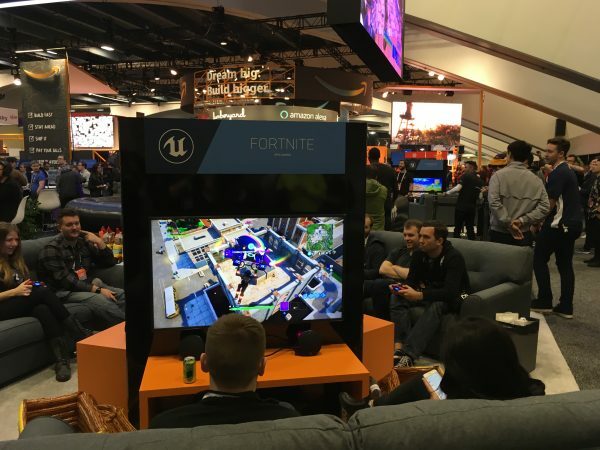 Not to be left out, the mobile version of Fortnite was fully playable on a large TV. Double Fine’s indie focused Day of the Devs event took place off-site as per usual but this elaborate skull themed display greeted attendees when taking the escalator down from the South Hall. In addition to playable demo stations you could also catch some of the developers behind featured games like Exo One, Minit and Knights & Bikes. 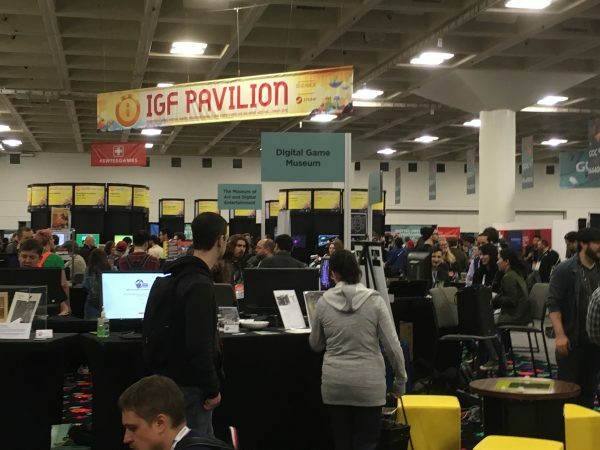 The 2018 Independent Games Festival awards took place alongside the Game Developer Choice Awards on the Wednesday of GDC week. Throughout the show-floor days (Wednesday – Friday) all of the nominees could be played at a single station in this circular configuration. 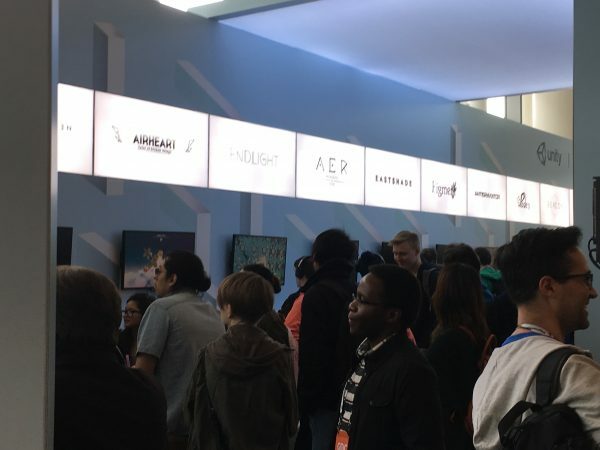 Games like Night in The Woods, Baba is You, Cuphead and Shenzen I/O were playable by attendees. In years past it wasn’t uncommon to actually meet the developers behind these games while playing them at the IGF booth – sadly I didn’t get to meet anyone from the excellent Night In The Woods team this year ☹. 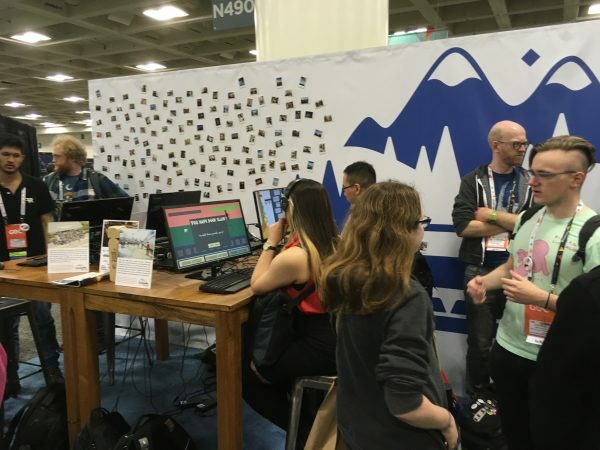 Over 80 independently created games & experiments were playable over at the Train Jam booth. I was lucky enough to take part in this year’s 52 hour game jam and our game Emotional Support Cat Girl was also playable at this booth as well. Creators from the Train Jam are also GDC Attendees for the most part so it wasn’t uncommon for creators to hang out at the booth and walk folks through their creations. I didn’t have much time to go 1 on 1 with folks to show them Emotional Support Catgirl in person but I will have an exhaustive blog post outlining our amazing cross-America journey later on in the week. A large Azure Services booth greeted attendees when taking one of the two main elevators down to the expo show-floor. 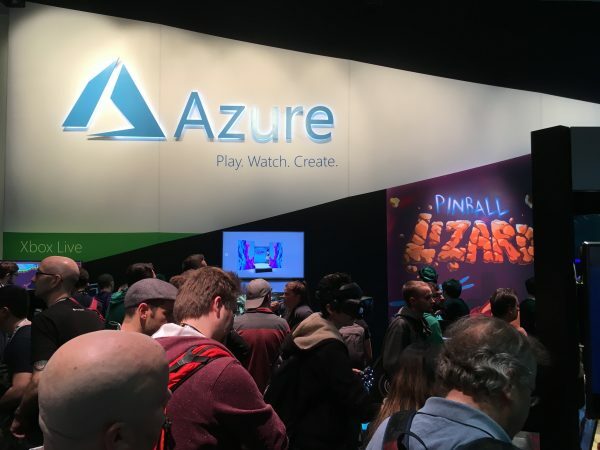 Microsoft had a large floor presence this year aimed squarely at game developers and the cloud based development services that can help devs collaborate, test and deploy their upcoming projects. 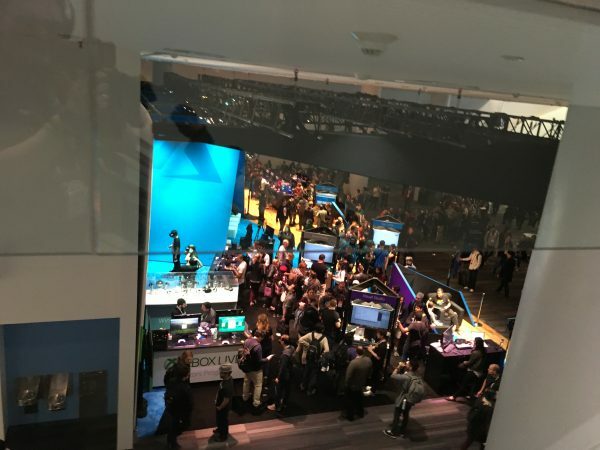 Services like Azure Application Monitoring– which gives developers real-time reports on the use of their games and applications, Visual Studio Enterprise – Microsoft’s premium integrated development environment and the Xbox Live Creators program – which allows independent developers to publish on the Xbox One platform – were all on display. By visiting four of the available demo stations developers were able to score both $2500 USD worth of Azure Credits for virtual machine testing and a free Xbox One controller. Disclosure: as a member of the Microsoft Developer Network and Bizspark Program I was not the intended audience for these workshops, I already have access to all of these services. The free controller will definitely be useful for my development work, however. 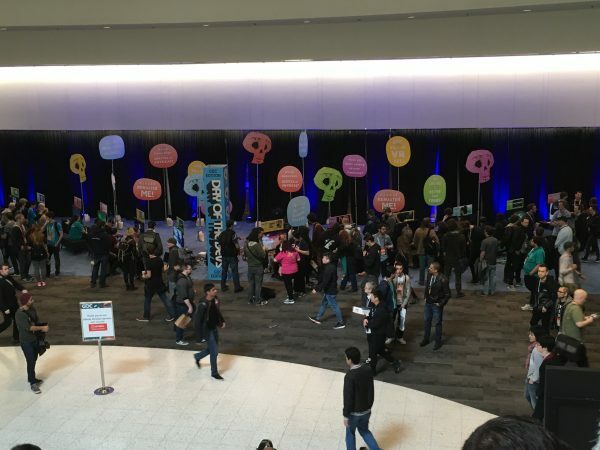 Google uses its presence in the mobile space with Android and its real-world presence in Silicon Valley to attract Android developers to GDC. Not only do they host a keynote focused on the future of their mobile platform but also full day workshops for developers on pre-launch and post-launch support of their mobile games. 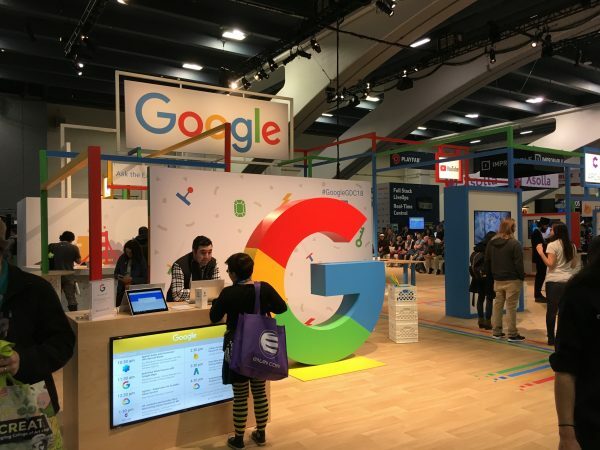 Aside from the giant G logo and familiar Google Employees in blue shirts there wasn’t much on display at their booth to speak of. At GDC Google did announce the interesting “instant app” addition to the Play Store which allows customers to download a small 10MB trial version of a game and play it within seconds without needing to install anything on their device. Given the size of some Android Games 10MB could be as small as a 30 second sample of the gameplay, while other smaller games have the chance to offer players a much more feature complete experience within those confines. 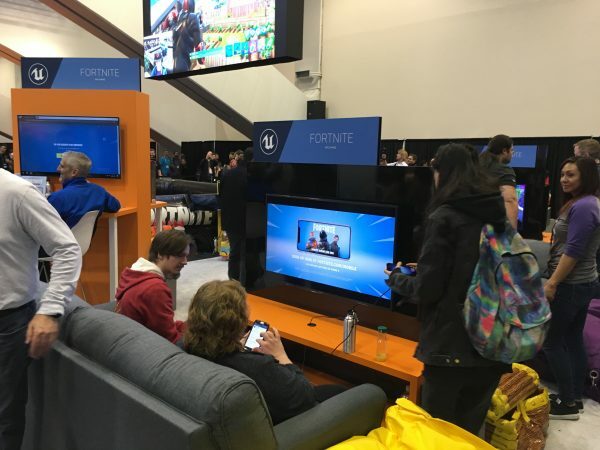 Sony always has a huge display at conventions like PAX East, E3 and PAX West but did the development focus of GDC stop them from bringing some of the latest creation on their platform? Of course not! Playable games at the PlayStation Booth included the recently released Shadow of the Colossus remake, Monster Hunter: World, Gran Turismo Sport and Ni No Kuni: Revenant Kingdom. 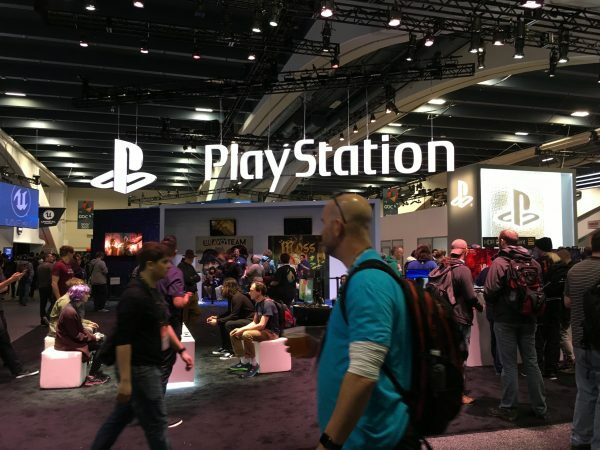 Sony also held a number of developer talks and workshops across the five days of GDC focusing on the visual arts achievements that Sony has made on the PlayStation 4, how devs can help fight fraud in an online gaming space and a Final Fantasy Collaboration focused workshop. Unity has quickly become the darling of indie creators and the engine that powers some of the most notable AAA releases as well. Upcoming titles like Escape From Tarkov, In the Valley of the Gods, Praey For the Gods and Hollow Knight all use the suite of tools made available for free by Unity Technologies. While Unity might not offer the complete beginner friendly experience of something like Game Maker or Clickteam Fusion but it does offer a great gateway to full fledged game development. Alongside a whole range of professional grade 3D, 2D and lighting tools – developers also get access to some of the most exhaustive documentation systems around. Also the Unity community has probably answered almost every question asked about the engine at this point. I’m not trying to come off as a paid Unity shill or that this section of the post is an advertisement – it’s not. But I’ve been personally making games in Unity for the past 2 years as my full time gig and it has been such a rewarding experience. What you lose in easy prototype-ability you gain in coding experience, game making fundamentals and probably the most beneficial to me personally – learning how to properly debug a game from conception through to post launch support. In terms of what was on offer for newly budding developers and experienced veterans – Unity offered a quiet lounge space for Unity devs to hang out, grab a coke and just relax from the high stress environment. This space wasn’t entirely ultrisitic however – staffers from the engine developer were also on hand to inform visitors about upcoming Unity focused events like their Rendering Bootcamp, Keynote, Work Flow workshop and also to recruit for Unity Europe. 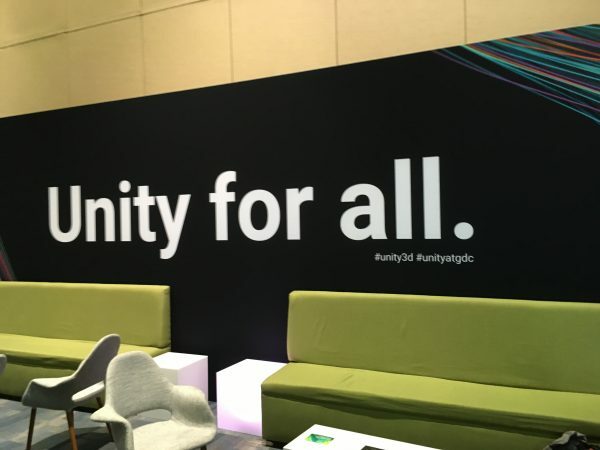 Also on the floor of the West Hall (where most GDC panels take place) was a large “Made With Unity 3D” booth which gave folks the chance to check out multiple games made in Unity 5. Lastly I’d like to highlight something I spotted at Unreal’s massive booth. 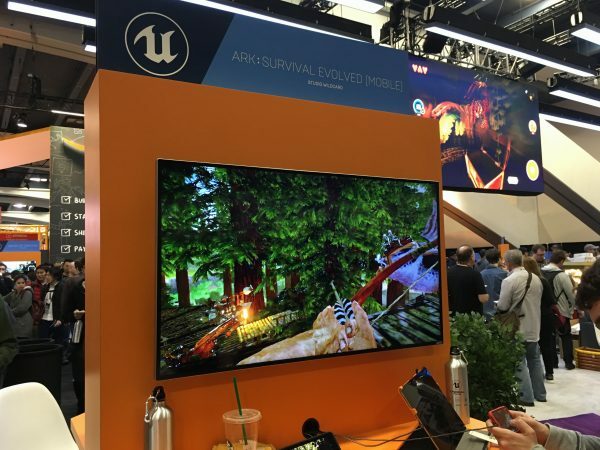 Sandwiched in-between all of the Fortnite chaos, live engine demonstrations and AAA games was the mobile version of ARK Survival Evolved that had just been announced days prior. I didn’t get a chance to snag any off-screen video of the game running (tho I wish I had) but I did manage to snag a few interesting stills that I’ll post in the coming days. Suffice to say that the upcoming mobile conversion for ARK looks and plays rather faithful to the original – oh and there’s also the upcoming Nintendo Switch port of ARK, which was not on the show floor.